Of all the food trucks I wouldn't have thought I'd get addicted to, it's this one: Tropical Shave Ice. But it makes sense that I would be. This sunny weather has something to do with it. And there's the fact that anytime I see the Tropical Shave Ice truck at OC Din Din A Go Go at Irvine Lanes on Wednesday nights, it feels like a block party. Of course, I can't discount that shave ice always reminds me of Hawaii. But theirs is somehow even better than those I've had in the island state. Their machines doesn't just shave the ice as much as turns it into soft-pack snow. The flakes are such that it fluffs and almost floats. It's so fleeting and precious that just the short walk back to my car is enough to turn half of the mound back into liquid water. This is shave ice that must be eaten straight away the moment you take possession. The syrups they use are somehow not syrup-y, not cloying or too artificial. Lamentably, they do seem to always run out of the lilikoi (passion fruit) before I get there. I always opt for ice cream to be deposited to the bottom of the cup/cone, because when the whole thing does liquefy, the icy/milky slurry that's left behind becomes like the pensieve in the Harry Potter books and movies: it contains all my fondest Hawaiian memories. I agree. This is one of the better trucks out there! By the way, I think I've seen the hurricane popcorn mix at Cost Plus once. Cool. Will look for it next time. Blah, let me try posting a comment again hah. I've been hearing buzz for this truck for a while now, but was hesitate. However, thanks for sharing that their syrups are not syrup-y or too artificial. That was the main reason keeping me from trying the place. Also, good to hear they use snow ice. I just assumed they used the standard "harder" ice. Thanks again and I really enjoy your blog! Thanks for leaving your comment! 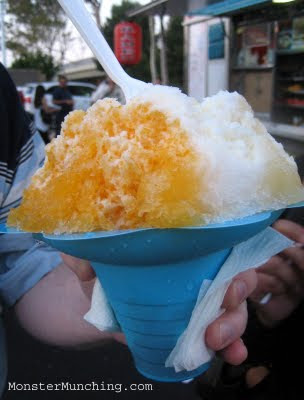 This one is the real deal Hawaiian shave ice: fluffy and delish! I'm enjoying looking through your blog now. I see you're in OC a lot too! Wow!!! 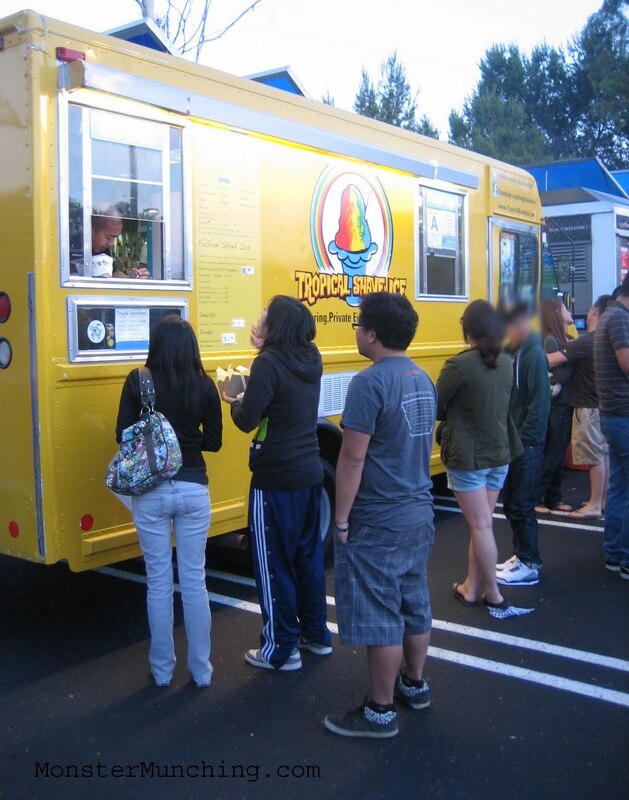 Wish we had a Tropical Shave Ice truck where I live! I love snow cones, but thought they were too syrupy. These sound so much better!! !